Does the average guy or gal need body armor? Should you go about your normal day wearing concealable armor? I can’t answer for you. While body armor isn’t something I would consider wearing during normal day-to-day activities, I live in rural West Virginia where I have about as much chance winning the lottery as getting shot. However, if I lived in Detroit or Chicago, I might have a different outlook on the situation. Nonetheless, I wouldn’t look at someone who wears body armor as some sort of freak. Humans do all sorts of weird things for their health and protection and wearing body armor is no different. Most rational folks might not see it this way, cops included. Show up at the bank wearing body armor and a gun and you might rouse suspicion. Even though both are legal to do in many states, it could be perceived as, well… unusual. Some like the idea of body armor to be kept at home in the instance of a home invasion or maybe as a tool to be used after a cataclysmic event such as a natural disaster, or worse. This seems logical and most would consider it less paranoid than the daily wearing of a bulletproof vest. For only $300 the threat level IIIA vest from BulletSafe offers a lot of protection for a limited investment. The prompt for this essay came in the form of a package in the mail from a company called BulletSafe out of Troy, Mich. BulletSafe manufacturers 3A Level body armor and it is all wrapped up in a nice vest you can put on or take off in seconds. The package had a sample in my size and was accompanied by a note requesting me to test it. Not just by wearing it but by shooting it. I don’t have an aversion to shooting things so this was appealing to me. What was also appealing was the notion that this Level 3A vest, which has a handy front pouch designed for a ballistic plate, could serve as a rather effective home defense tool. You could place the vest under the bed and stuff your handgun and flashlight down in the front pouch. When the bad guys come knocking, you could slip on your vest and you would be protected and armed. 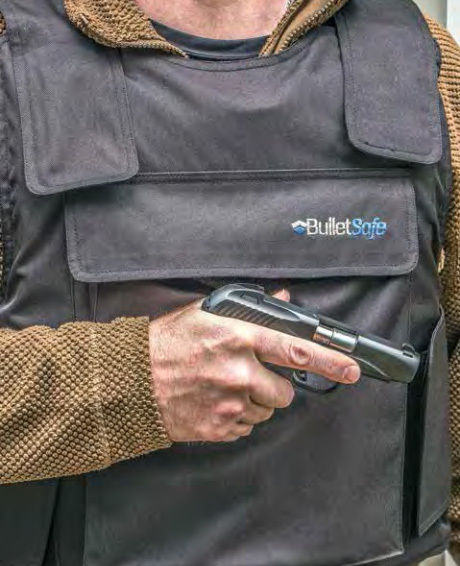 A neat aspect of the BulletSafe body armor vest is it has a Velcro closure on the front so you can slip in a ballistic panel for extra protection. You can also use this pouch to store a handgun and flashlight if the vest might be used in a home protection scenario. Maybe more importantly was the fact this vest has a suggested retail price of $299.00. You may not be familiar with soft body armor but in the world of ballistic protection this is cheap because most name brand ballistic vest sale for twice to three times that much. So, the obvious question was, would it work? A threat Level 3A vest should stop just about any defensive handgun round so I grabbed a 147-grain 9mm load with a muzzle velocity of 950, a 180-grain .40 S&W load with a muzzle velocity of 985 fps and a .357 Magnum 158-grain, SJSP load with a velocity of 1,255 fps. I also selected a wickedly deep-penetrating 130- grain .327 Federal Magnum hardcast bullet load with a muzzle velocity of 1,402 fps. That bullet will penetrate in excess of 36" in 10 percent gelatin. I removed the back panel of the vest and placed it on a roll of beach towels and shot it with each of these loads. The .327 Federal hardcast load from Buffalo Bore penetrated the deepest; it passed through seven layers of material. The .357 Magnum load showed the least penetration by only going through two layers of material. The .40 S&W and the 9mm penetrated three and five layers respectively. Considering this ballistic panel had more than 40 layers, I’d say it offers sufficient protection. Keep in mind even though the bullets only penetrated a few layers of material, this is party due to the fact those other layers were present and providing resistance. 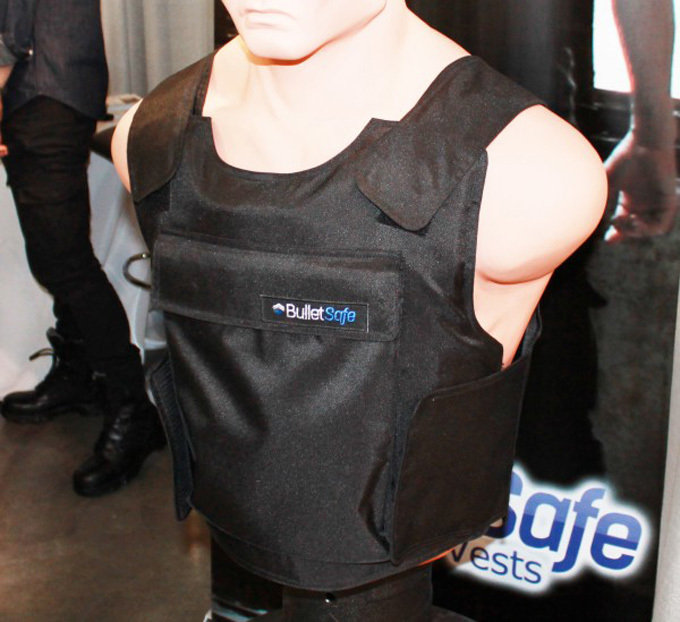 Four loads were fired into a panel on the BulletSafe vest. The deepest penetration was through only seven of the more than 40 layers of ballistic fiber. Loads were: 147-grain 9mm, 180-grain .40 S&W, 158-grain .357 Magnum and 130-grain .327 Federal Magnum. If you live in an area where you think bad things might happen or, if you believe you might have to defend you home and family form invasion, my first suggestion would be to move. Of course, this may not be a viable option so the acquisition of a bulletproof vest might not be a bad idea. Especially when BulletSafe is selling them for three hundred bucks. Most companies who manufacture body armor will sell to civilians as long as they are not convicted felons. However, none will sell to civilians who live in the great state of Connecticut. If someone is shooting at you in Connecticut, best find an engine block or a thick tree to get behind — your state government has an aversion to you protecting yourself with tools designed for that purpose. The National Institute of Justice (NIJ) rates body armor based on its ability to stop bullets. All bullets fired from all guns are not created equal nor do they perform the same way. Some bullets are designed to provide maximum expansion, while others are intended to penetrate deep. In either case, velocity is a key element in determining expansion and penetration. What the NIJ has done is establish body armor threat levels by subjecting the armor to various projectiles. The NIJ Standard on the Ballistic Resistance of Body Armor (NIJ Standard-0101.06) is an 89-page document that sets forth body armor testing protocol. More importantly, it establishes protection levels so consumers can determine the threat level they need or desire. There are four threat levels established by the NIJ. Threat Level 2A offers the least protection and Threat Level 4 the most. These levels also represent wearer comfort; Threat Level 4 is the least comfortable to wear and Threat Level 2A the most. 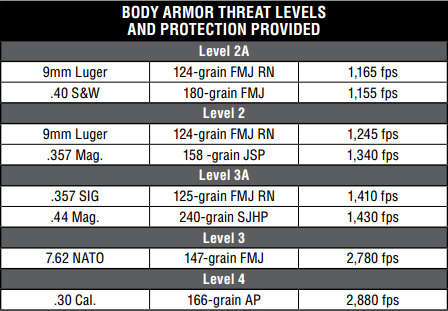 The ballistics table above shows the various loads that body armor must be capable of stopping to achieve a certain rating. What might surprise you is the bullets used in these tests are, in most cases, non-expanding full metal jacket bullets. There is a reason for this. While the most terminally destructive bullets are of the hollow point design, they are also the easiest bullets for body armor to stop. For soft body armor, the hardest bullet to stop is one of a small diameter going fast and will not deform on impact. Even though Threat Level 2A body armor will protect you from the most common defensive handgun loads, especially if those loads utilize expanding/JHP bullets, it will not protect you from what many would consider a much less lethal round. The little .17 HMR rimfire cartridge is devilishly difficult to stop due to its high velocity and very small diameter; it will shoot clean through two panels of Threat Level 2 armor. I wore body armor for 13 years while working as a police officer. It was never fun and it was never comfortable, even in cold weather when you’d think the added layer would be appreciated. While working New Orleans after Katrina, I would have mortgaged my home for some high-tech body-cooling device to wear under my vest. Humidity and heat can make body armor seriously unbearable. Get Yours Now! Level IIIA Vests and Ballistic Plates at Unbeatable Prices! Just as all bullets are not created equally, body armor varies a great deal, even within the same threat level. Some is more comfortable to wear due to the materials used or the shape and fit. If you are considering wearing body armor on a daily basis for extended periods of time, I strongly suggest you be just as concerned about comfort as you are protection. It’s kind of like selecting a defensive handgun; if it’s not comfortable to have on your body, you’ll leave it at home or in the truck where it offers no protection at all. "This post contains affiliate links and I'll earn a small commission if you shop through them. This is how we help to make money so we can continue to bring you amazing content"